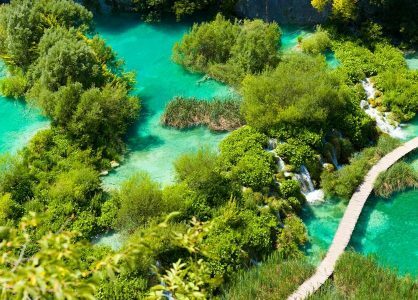 Amongst the forested hills of Croatia’s hinterland lies this breathtaking collection of sixteen lakes, connected by almost 20km of paths and bridges that take you through the forests, across the lakes and near the waterfalls. Over the course of thousands of years, the water running down the limestone hills created natural dams, through a process called karstification. This slowly reshaped the landscape, creating beautiful lakes, rapids and waterfalls, a process which continues to this day. The forests and the lakes of this UNESCO World Heritage site are home to a variety animal species, from wolves and bears to many types of rare birds and fish. Visitors do not have to worry though, as the potentially dangerous animals stay far away from the areas of the park that are open to the public. After all, they are more afraid of us than we are of them. If you are planning to visit the park, you may want to have a look at the various trails that you can choose from. Each trail will lead you through a different area of the park and, depending on the amount of time you have available, you can choose a trail that is right for you. You don’t necessarily have to follow a trail. You can plan your own route through the park and, as long as you follow the existing paths, you will not have to worry about getting lost at all. The park has two main entrances, entrance number one (Rastovača) and two (Hladovina) and both entrances offer a large parking place where you can park your car for 7 Kuna per hour. Plitvice Lakes is open daily from 8am throughout the year. The closing time depends on the season; in the winter the park usually closes at 4pm and in the summer at 8pm. 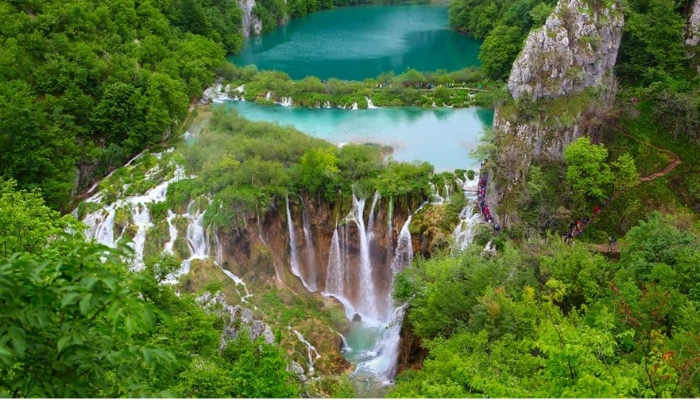 Plitvice Lakes is divided between the Lower Lakes and the Upper Lakes, separated by the 3km long Lake Kozjak. 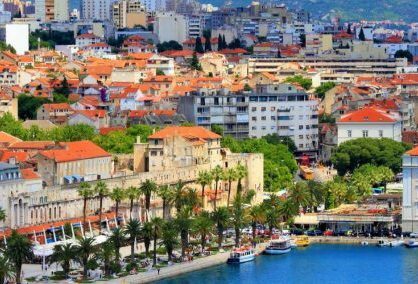 You can easily explore either the lower or the upper part of the lakes in half a day, and both parts in one day. The scenery of the Upper Lakes is somewhat wilder than the Lower Lakes, and many people find the Upper Lakes more spectacular. Maybe this also has something to do with the fact that you can walk over the waterfalls via wooden bridges and see the water foaming and hear it roaring beneath your feet. Here you will find a lot of wooden footbridges running across the lakes. The Lower Lakes are squeezed between steep cliffs, forming a gorge and offering an abundance of grottoes and caves. The wooden bridges here are right at the water level. Even though most people agree that the Upper Lakes are more interesting to visit, the Lower Lakes receive more visitors. 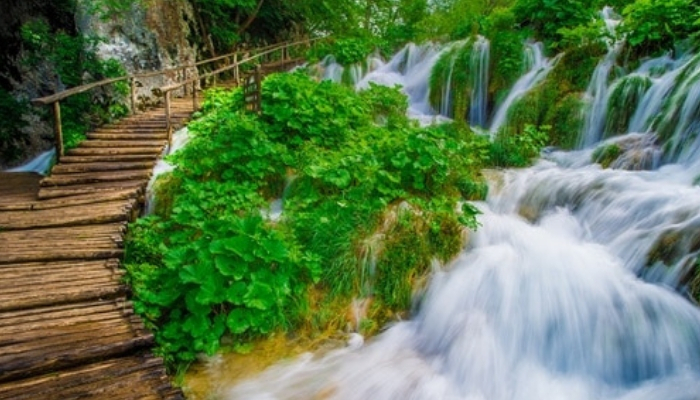 This is due to the fact that the park’s tallest waterfall, the Veliki Slap, is located in the Lower Lakes and many people who can only visit part of the park decide to see the Veliki Slap. If you choose to enter the park via entrance 1 (near the Lower Lakes), you can choose between trails A, B, C and K. If you enter via entrance 2 (near the Upper Lakes), you can choose between trails E, F, H and K. The shortest trail will take about 2 to 3 hours to walk, and the longest trail about 6 to 8 hours. An electric boat shuttles visitors between the Upper and Lower Lakes, allowing you to take a 20 min. break from walking and enjoy the scenery from the water (see the dotted line between P2 and P3 on the map). There is also a short, 5 min. boat ride (see dotted line between P1 and P2 on the map) that takes you from one side of the lake to the other. Besides these two shuttle boats, there is also a bus that runs back and forth between the upper and the lower lakes (see dotted line between St1, St2 and St4 on the map). Using the shuttle boat and shuttle bus is included in the entrance ticker price.